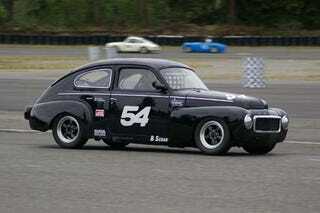 Forget Those Newfangled Amazons And Race A Volvo 544! I'm falling dreadfully behind on the pro-quality racing photos sent in by VintageRacer, so we're going to follow up on the Alfa Romeo P3 with a pair of Volvo 544s that run at Pacific Northwest racing events. Amazing how the dowdy 544 suddenly becomes gorgeous with the subtraction of some ride height and the addition of racing wheels (and added horsepower). Yes, we know an Amazon sneaked into the gallery.